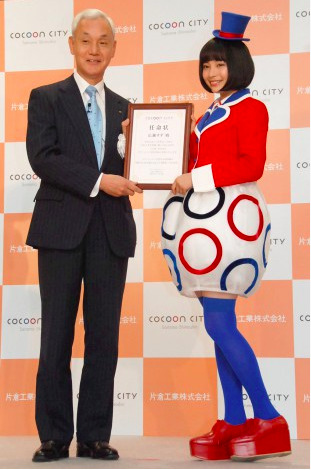 On April 21, actress Hirose Suzu attended the opening ceremony and CM presentation for Cocoon City opening in Saitama this Friday. During the event, Hirose revealed that she goes to sing karaoke by herself, "I dance as if I'm insane. I dance quite seriously." She apparently has a set list ready when she goes singing. "I love AKB48. I also sing Shoujo Jidai and B'z," she shared. Hirose also talked about her love for shopping and how she even goes shopping by herself. She added, "I also go out to eat by myself. I must have no aura. No one seems to notice me." Hirose was appointed the first mayor of Cocoon City. On this day, she appeared at the event wearing a skirt resembling a cocoon that she wore for the CM shoot. She said, "I don't often wear clothes with a pop pattern, so it was refreshing and fun. I was really excited during the shoot." The CM starring Hirose will air beginning April 22.